My name is Jennifer and I am addicted to espresso, especially when it’s paired with chocolate. That combo is on par with lime and tequila, wine and cheese, strawberries and whipped cream. You infuse a shortbread dough with a shot of espresso and four ounces of finely chopped bittersweet chocolate. I used a four-ounce Ghirardelli bittersweet chocolate bar which I found in the baking aisle. 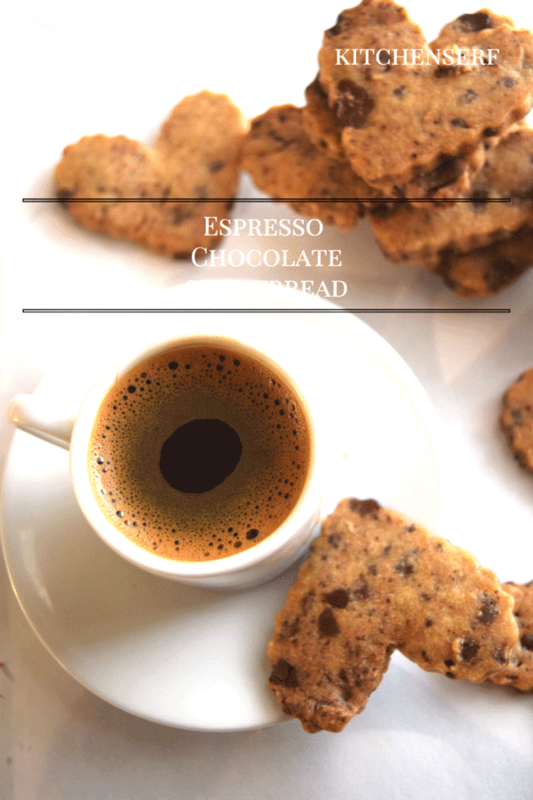 This recipe is inspired from Dorie Greenspan’s recipe for Espresso Chocolate Sables in her Dorie’s Cookies cookbook. Finely chopping the chocolate is key. You’ll see from the photos that some of the cookies have visible chunks of chocolate. Delicious? Yes. But the chunks made it difficult to roll out the dough. Next time, I’ll be sure to really chop the chocolate finely or I’ll throw the chocolate in the food processor. Overall, I’m thrilled with these cookies. 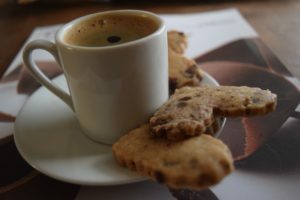 I fell in love with espresso shortbread at a kitchen supply store that also slings espresso drinks. The espresso shortbread however, is only available at the shop for a couple weeks a year. The shop rolls the shortbread into hearts then dips half in dark chocolate. They are so good. I had planned to dip these cookies too but decided that would be gilding the lily. This recipe has just seven ingredients and takes less than 15 minutes, which includes rolling time, to make and put in the fridge to chill. Remember that shortbread doesn’t use eggs. Add flour, beat on low until just combined. Don’t overmix, this will make the cookie tough. Open the gallon size Ziploc bag and using your hands or a spatula, put the cookie dough in the bag and leave the top unzipped. Flip the bag over while you’re rolling out the dough and lift up the plastic bag in any places where it’s forming creases. Once you’re done rolling the dough, seal the bag and refrigerate for a minimum of two hours, preferably overnight. Bake within two days. Shortbread dough tends to dry out. Line counter with a piece of parchment paper large enough for the dough. Cut plastic bag away from cookie dough and lay the dough on the parchment paper. Using a ruler cut dough into 1.5 inch squares or use a small cookie cutter. Continue cutting dough until finished. Put cookies on a piece of parchment paper or a Silpat on a cookie sheet. Prick each cookie with a fork. My batch made about 30 cookies but I think I could have rolled the dough a bit thinner and ended up with a bigger yield. What are your thoughts about shortbread? To be perfectly honest, I didn’t love it until I discovered the espresso/chocolate combination. Have you tried these cookies? If you make them, send me a photo. I adore shortbread! It was my dad’s favorite cookie, and I have a soft spot for it – but also every time I eat it am smitten with the simplicity and rich taste. I’d be smitten ten times more with these, for sure!!! They look delicious. I think you’ve nailed it, the allure of shortbread is the simplicity. I love it when recipes are both simple and delicious.